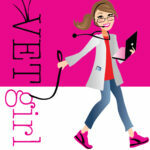 In veterinary medicine, a peripheral blood smear is often used to complement a complete blood count (CBC) or hematology panel, especially when the CBC is done on a machine where interpretation may be lacking or even unavailable. 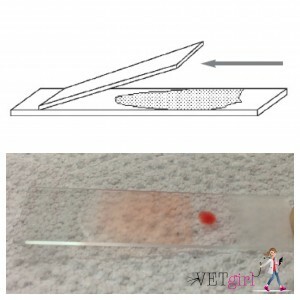 A blood smear is used to diagnose and/or monitor numerous conditions including appropriate number and morphology of white blood cells (WBCs), red blood cells (RBCs), and/or platelets (PLT). 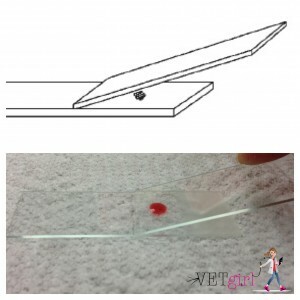 To make a good blood smear, very little equipment is needed (aside from practice in how to create a good smear and a good microscope!). 2) Use the second slide as a "spreader" slide. 3) Place the end of the spreader slide on the sample slide so that the short sided edge of the spreader is below the drop of blood. 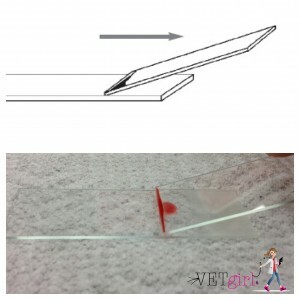 4) Hold the spreader slide at an angle of 30o to 45o (relative to the sample slide) and bring the spreader slide back against the drop of blood so that the blood spreads in a thin line via capillary action. 5) Rapidly - but gently - drag the spreader slide along the entire length of the sample slide in one fluid motion. 6) If the technique was performed correctly, the smear should end before the end of the sample slide in a "feathered edge." 7) Air dry the sample slide. Fix and stain the slide. Once the blood smear is made, we then need to evaluate the sample for abnormalities. Evaluate the appropriate section on the slide where high power should be used, avoiding any thick or non-representative areas of the slide. Count the number of leukocytes in at least 3 fields and calculate the average number per field. Multiply this number by 1500 to get the approximate total WBC count. Count the number of platelets in at least 5 fields and calculate the average number. Multiply this by 10,000-15,000 to get the approximate total number of platelets. Anyone else that we missed that you like doing blood smears on? Help! I stained my blood smear in class but I forgot to wash or put water after the darkest stain. Will it affect something or is it okay what happened? It’ll be very purple and unlikely to be readable.